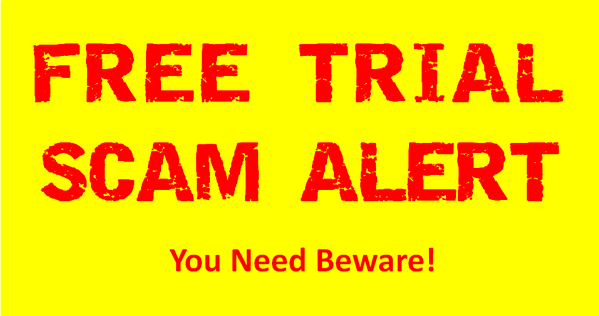 Boy, there sure are a LOT of unscrupulous vendors out there on the internet and they seem to be the ones offering FREE TRIALS for their products. I got caught up in one such scam when ordering a free sample earlier this year. Pay shipping costs only, they promise you … yeah, right! Once they have your credit card information they have the key to charging you monthly going forward. So … here’s a PERFECT solution you can use so that you NEVER get caught up in any such scam again … or ever, if you’ve been so fortunate this far. When ordering a product online, make SURE there is a MONEY BACK guarantee, or … if they want you to pay shipping only … NEVER EVER give that website your credit card. However, IF a product is offering buyers the option to use PayPal then at least this way you will have someone in your corner, protecting your credit card information … AND … readily available to offer you help in receiving your money back IF the seller of the product refuses to refund you your money. PayPal has standards set in place to protect their PayPal users … standards that credit card companies REFUSE to install in order to protect their credit card holders. This is why I LOVE PayPal! If PayPal finds a vendor to be unscrupulous with their customers, they will lose their right to offer PayPal as a method of payment for their customers. This is a PERFECT red flag for you to watch out for going forward. As for affiliate marketers, you need to beware of unscrupulous vendors no matter HOW MUCH THEY OFFER TO PAY YOU! The first step that an honest affiliate marketer should do is ALWAYS be your potential customer’s advocate. If a money back guarantee is not offered, if the product or vendor looks to be unscrupulous in ANY way, then NEVER EVER become an affiliate of that vendor, else you too will wear their bad reputation online for EVER. If you’re still not clear on what I am referring to, check out what Marketplace discovered during their researching the many complaints sent into them regarding these types of free offer scams. Personally, I refuse to promote dishonest vendors and their products simply because I prefer to make less money and have website visitors know that they can trust my links 100%! The crooked vendors may get rich on the backs of many but I’m certain they will not remain “rich”. T’is much better and easier for me to sleep at night (look myself in the mirror), knowing that the affiliate links I share are nothing shy of being 100% trustworthy. Please, DON’T YOU GET SCAMMED! If you have been scammed on this (or any other) product… please share your story in a comment below.